Creative leadership is a universally sought after skill. It’s crucial to the success of individuals, departments and even entire companies. Today’s employers want candidates bold enough to try new approaches to old problems, and old (but effective) approaches to new problems. However, when it comes to challenging students to think outside the box, soft skills like creativity are often overlooked. While STEM-based education programs help students develop essential science, math and analytical thinking skills, they don’t always provide them with the creative experiences they need to look at the world in new ways. In order to help bridge the growing disparity between education and the changing needs of the job market, educators have been looking to integrate art into STEM curriculums — creating the movement known as STEAM (science, technology, engineering, arts and math) education. STEAM curriculums are about so much more than just teaching students to paint or draw. While fine arts programs are beneficial to students regardless of where they come from or how they learn, implementing any form of art into your curriculum encourages students to think differently or approach a problem in a new way. I think a big difference in STEM vs. STEAM is the ability to not only know the “hard sciences,” but to be able to communicate more effectively. The “A” — whether achieved through fine arts, liberal arts or both — adds the ability to look at a situation from new and creative angles and express concepts and information clearly. When I worked with second graders as a volunteer art teacher, I saw children blossom in art class. It seemed like all students could relate to the subject in some way. Art encourages young learners to combine multiple skills and ways of thinking. When students are given the opportunity to use both the right and left sides of their brains, they’re more likely to reach their full potential both in and out of the classroom. Educators can begin to bring STEAM education to life simply by challenging students to present a topic differently or look at a lesson from another angle. When I was teaching college, I had students present material in a debate format, which challenged them to think on their feet and discuss the concepts in a new light. The new format helped them develop a deeper understanding of both sides of the issue and empathy for classmates with different views. While it’s relatively straightforward to teach students hard facts or skills, teaching creativity and other soft skills can be more difficult. One of the best things educators can do is to foster an environment where students feel free to express themselves. Many concepts from the Design Thinking philosophy can be practiced to get new ideas flowing, including reframing a challenge, or idea mapping. After all, the inherent value in STEAM is helping students develop creative leadership skills and more efficient ways to communicate, in addition to the methodological skills STEM provides. Encourage creativity with digital tools. This eBook offers year-round ideas on how to integrate technology into your classroom. Technology can boost creativity by manifesting ideas in new ways. 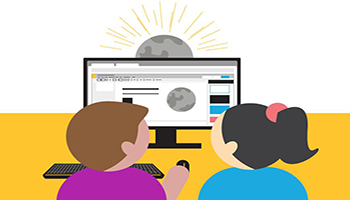 Students can go on the internet for instant access to an array of perspectives. When I was growing up and had to do a report on World War II, my only options were to go to the library and check out the encyclopedia (if it wasn’t already checked out) or to call a grandparent. Now students can watch or record living history videos, and access thousands of resources without leaving their desk. The internet and education-based technologies are just as much creative tools as they are technical tools. In recent history, humans experienced the agricultural age, the industrial age and the information age, and now we’re in the midst of the innovation age. The ability to be comfortable with — and express — new ideas and perspectives are among this era’s most valuable commodities. However, in order to bring evolutionary ideas to life, you need to think in revolutionary ways and encourage others to do the same. Every student learns differently and brings a unique perspective to the classroom. By celebrating students’ differences as their biggest assets, STEAM education can unite schools and communities. When educators acknowledge the importance of the arts and creative thinking, students learn to better appreciate themselves and each other. Looking to integrate more digital tools into your classroom? Learn how emerging technology can transform the classroom experience.